When a research operation goes wrong and accidentally sets loose a prehistoric Megalodon, a team of scientific workers must do everything possible to keep this killer shark from reaching the shores and killing hundreds of people. 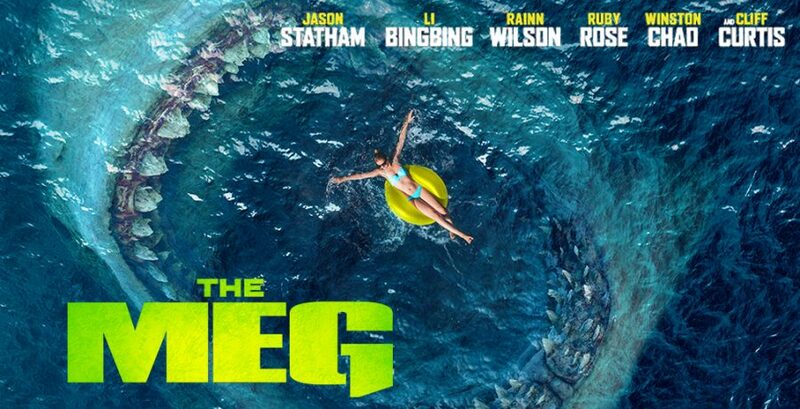 This movie is a thrilling and exciting ride when we see the Meg in action, but when it comes down to the actual plot and dialogue, this film starts to fall apart. The Meg herself had great CGI, which should be expected because the movie had a $150 million budget, and the visuals given of the new sea creatures and unexplored coral reef areas were excellent. The music and cinematography gave that “on the edge of your seat” experience the director (Jon Turteltaub) was going for. Some techniques Turteltaub used had been seen in previous films like Jaws (1975) and 47 Meters Down (2017), so they weren’t totally original but he still executed them well. As for the main characters, Jonas Taylor (Jason Statham) and Suyin (Bingbing Li) don’t have the best performances but their comedic and action scenes somewhat make up for it. The plot seemed pretty basic and it was easy to guess what’s going to be next (but I will admit the plot twist was not expected at ALL); and the dialogue seemed cheesy and somewhat forced to move the story along. The director also included some references to other fan favorite water-type movies. In one scene, Jonas is seen swimming in the ocean singing “just keep swimming, just keep swimming” as a reference to Finding Nemo, and then there is a dog named Pippin, which is also the name of the dog in Jaws. Sources say, Disney’s Hollywood Pictures purchased the rights to make The Meg in 1996, and the movie has been greenlit and shut down multiple times. In 2005, New Line Cinema started to develop the movie with a budget of $75 million, expected to release in 2006, but the company became concerned with the budget and overall quality of the script so it got shut down. In 2015, Warner Bros hired Dean Georgaris to write the script and this movie became a top priority. They cast all came together in 2016 and official filming begun in October 13, 2016. In comparison to Jaws, The Meg doesn’t stand a chance. But out by itself, as a movie where these characters have to stop a 75 ft shark from eating innocent beach goers, the job was pretty well done.